Today’s guest blog post comes from Nerys Williams, Audience Development Officer for Stoke-on-Trent Museums, based at Gladstone Pottery, who tells us why toilets are the unsung heroes of the modern world! Toilets: the unsung heroes of the modern world. Unappreciated, sniggered at and quite literally … well let’s not go into what we do upon them, this is Culture24 after all. Here at Gladstone Pottery Museum we think loos should be celebrated and recognised as the sanitary ware superheroes they actually are. They played a huge role in making ‘The Potteries’, but are eclipsed by the more palatable tableware we think of as establishing Stoke-on-Trent as ceramics central. Toilets save lives literally every day and if you’d like to find out more about how please take a look at http://www.wateraid.org/uk – amazingly, one in three people in the world don’t have one. At Gladstone we have hundreds: early ones, see-through ones, colourful ones, flowery ones, amazing Victorian painted ones, a Crapper, a Hartington flushing one similar to the one used by Elizabeth I and more. Our ‘Flushed with Pride’ section is chock full of toilet history and entertains and educates with more than an occasional nod to toilet humour. 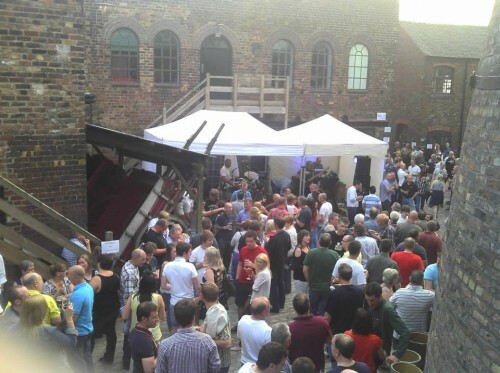 Buoyed up by our initial foray into Museums at Night last year we’ve quite got into this after-dark malarkey, with our splendid Beer Festivals and out pants-wettingly brilliant inaugural Gladstone Gig last December bringing a new lease of life to our cobbled courtyard. When I heard that those funny Modern Toss people were up to toilet related shenanigans for Museums at Night it would have been rude not to take part. An exhibition of their prints in OUR toilets was just too good to miss. It includes the Periodic Table of Swearing, which anyone who has developed workplace Tourette’s due to council cuts needs a copy of. (Number 91 is my current favourite). The chance to display Modern Toss’ Cistern Chapel exhibition was just too good to miss, so after a few hasty discussions to check what I was planning wasn’t too silly, here we are. A week from now, we’ll be hosting ‘Toilets by Twilight’, an all out loo extravaganza. Visitors can wander around our fabulous ‘Flushed with Pride’ building – the only permanent exhibition to the humble loo in the world, whilst enjoying some slightly-better-than-average wine. There’ll be the chance to quiz a toilet expert – for yes, in my role I have access to these people! When you feel the need to ‘go’ you can do so in one of the best appointed facilities around – our visitor toilet has not only the commonplace pan but a urinal and a ‘Lady P’ female urinal, and the walls will be adorned by the edgy (and very funny) prints Modern Toss are providing. To top it all off we’ll be showing ‘Carry On At Your Convenience’, simply because it would daft not to and there’s always room for a nudge and a wink! Tickets are £5 and available by calling 01782 237777, and we welcome you to come in 1970s fancy dress if you dare, to celebrate the fact that we became a museum 40 years ago this summer. Nerys Williams, Audience Development Officer for Stoke-on-Trent Museums. You can follow Gladstone Pottery Museum on Facebook here and follow Nerys Williams on Twitter @NerysWilliams.